French fashion and home retailer La Redoute, with more than seven million unique monthly online visitors is using an e-commerce, software-as-a-service (SaaS) platform to scale its marketplace. The Merchantry SaaS platform is facilitating the expansion of La Redoute’s marketplace, enabling the e-retailer to enlarge its product assortment by hundreds of thousands of items. 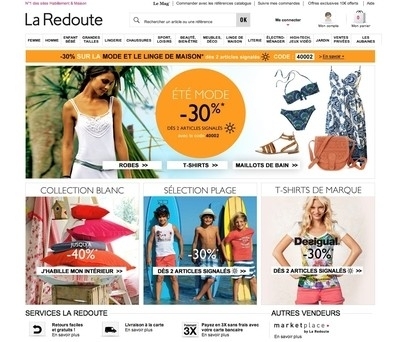 La Redoute initially launched a marketplace in November 2010 with technology developed in-house. Having successfully operated the marketplace for more than two years, La Redoute turned to Merchantry to complete its system and enable streamlined supplier on-boarding, while limiting maintenance and support requirements. Merchantry established a portal to integrate participating marketplace suppliers of all technical capabilities. Once on-boarded, supplier catalogues are merged with La Redoute’s own products into a single unified catalogue. The platform provides La Redoute’s marketplace suppliers with tools to upload product catalogues and manage orders and it enables sophisticated product matching logic and greater flexibility (for example, allowing for combined sources of content and/or inventory on a single product). It also provides the company with visibility of supplier performance. La Redoute is a trademark of Redcats Group, established in 26 countries including France and the UK. It is the second-largest distributor of women's clothing and the third-largest distributor of household linens in France, as reported by FEVAD’s Bilan eCommerce 2012 report.